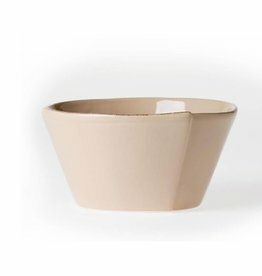 Make storage simple and easy with the Lastra White Stacking Cereal Bowl. Rustic and sophisticated, this quintessentially Italian collection adds warmth and charm to your tablescape or morning breakfast routine. 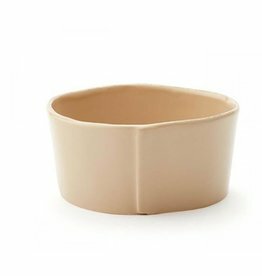 Durable microwave, dishwasher safe stoneware from Vietri in a beautiful new color. Mix and match with white, and also Lastra Fish! Lastra European Dinner Plate - White - 10.5"
Stoneware. The Lastra Cream Salad Plate is ideal for salads, desserts, or appetizers. The calming cream creates a clean, sophisticated table setting or easily mixes with other various colors and prints for a more eclectic look. Stoneware. The Lastra White Canape Plate adds an elegant yet subtle complement to any table. The beautiful combination of buttery cream with rustic accents is undeniably Italian. Microwave, freezer, dishwasher and oven safe and highly resistant to chipping. Melamine? Yes! They got this one right - looks identical to the stoneware, but affords outdoor use. Lightweight yet sturdy with a glossy finish, this collection is ideal for outdoor use or meals with children. Indulge in the creamy cappuccino color of the Lastra Cappuccino Espresso Cup & Saucer during your morning routine. 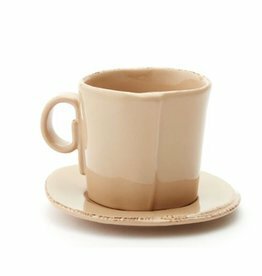 Rustic, chic, and endlesssly charming, the Lastra Cappuccino Espresso Cup & Saucer incorporates Italian elements into your morning routine. Begin your day with a helping of your favorite berries, granola, and yogurt in the Lastra Cappuccino Cereal Bowl. Mix and match this handcrafted Italian stoneware collection with other VIETRI collections to create your own unique style. Begin your meal with a fresh arugula salad before reusing again for a traditional spaghetti recipe in the Lastra Cappuccino Pasta Bowl. Easily transition between courses with this simple and versatile collection. 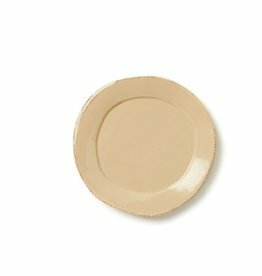 Create a clean, sophisticated table setting with the creamy cappuccino color of the Lastra Cappuccino Salad Plate. Mix with other colors and prints for a more eclectic look or keep it simple, either way your table is sure to be a conversation starter. Lastra European Dinner Plate - Gray - 10.5"
Mix and match with Lastra white, grey, or Lastra Fish! Dinner setting and many great serving pieces available. On trend in aqua, the rustic yet chic shape of the mug looks clean and sophisticated on your table. Handformed in Tuscany of Italian stoneware. Available in all Lastra colors.